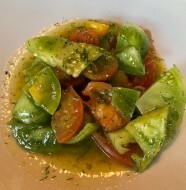 In The Kitchen Buzzz’s kitchens, we use Muir Glen Organic Tomatoes® because of their natural, sweet flavor, minus the salty, acidy aftertaste. 1. Using a knife and working on a cutting board, trim and discard the eggplant tips. 2. Cut the eggplant into 3/4-inch slices. Cut slices into 3/4-inch pieces. 3. Place eggplant in a colander set over a large bowl. 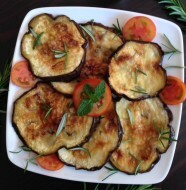 Sprinkle the eggplant with 2 tablespoons salt. Using hands, toss the eggplant and salt; set aside 20 minutes for bitter juices to drain). 4. After 20 minutes, and using plastic gloves, place about 2/3 cup eggplant pieces in between hands. Press hands together over sink, allowing eggplant juices to escape. Set the pressed eggplant aside in a large bowl. 5. Meanwhile, in an 8-quart stockpot, heat the oil on medium-high setting. Stir in the eggplant. With a wooden spoon, sauté eggplant on high setting, stirring occasionally, for 6 to 8 minutes or until it is light golden brown. 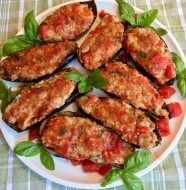 If high heat browns eggplant too quickly, lower it to medium-high. 6. Stir in the bell pepper, celery and onion pieces and cook, stirring occasionally, on medium-high setting for 3 to 4 minutes or until onion is translucent. 7. Add the reserved tomato juice, Muir Glen Organic Crushed Tomatoes®, balsamic vinegar and sugar; cook 5 minutes, stirring occasionally, on medium-high setting. 8. After 5 minutes, stir in the capers and olive slices; cook an additional 2 minutes. 9. After 2 minutes, taste the caponata and, if needed, adjust salt level. Stir in the black pepper. 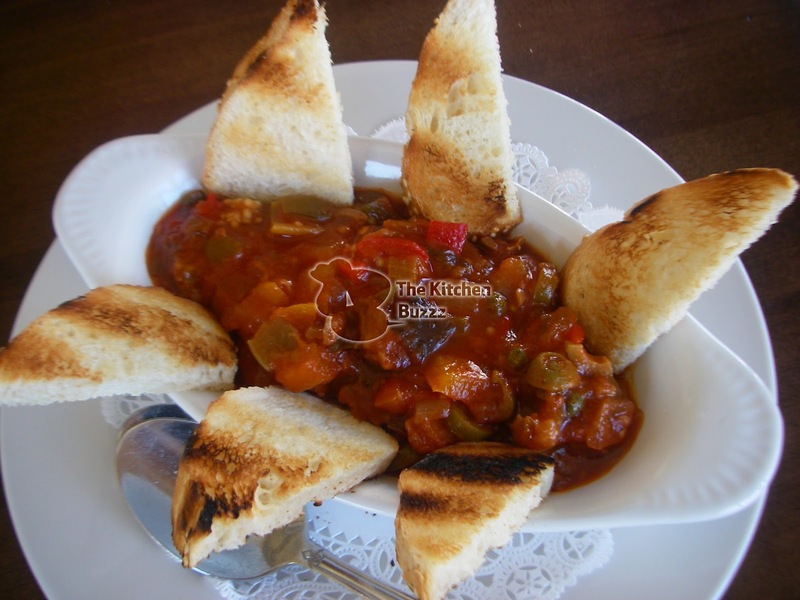 Enjoy Eggplant Caponata as an appetizer with fresh Italian bread or toasts. To serve with Italian toasts, called “bruschette” – arrange Eggplant Caponata atop bruschette and serve immediately. Red wine pairing: Chianti or Cabernet Sauvignon. Text and Photographs ©2012 Nancy DeLucia Real.